Kazan Cathedral is a Russian Orthodox church located on the northeast corner of Red Square in Moscow. The current building is a reconstruction of the original church which was destroyed at the direction of then Premier of the Soviet Union, Joseph Stalin in 1936. The original church was erected as a shrine in the early 1630s to mark the city's liberation from the Polish aggressors by the Russian people's volunteer army at the close of the Time of Troubles. Upon clearing Moscow from the Poles in 1612, Prince Dmitry Pozharsky attributed his success to the divine help of the icon Theotokos of Kazan, to whom he had prayed on several occasions. 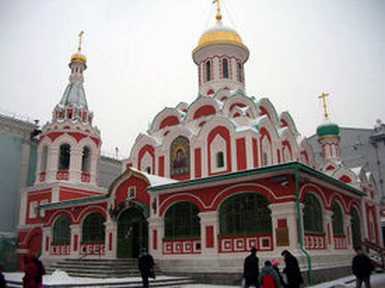 From his private funds, he financed construction of a wooden church to the Virgin of Kazan on Red Square in Moscow. 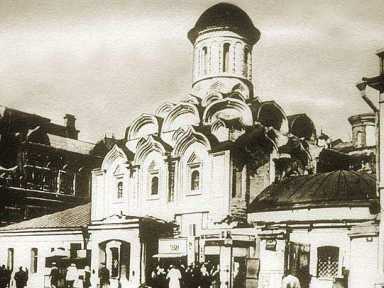 After the diminutive shrine was destroyed by fire in 1632, the Tsar ordered it replaced by a brick church. The one-domed edifice, featuring several tiers of kokoshniki, a wide gallery and a tented belfry, was consecrated in October 1636. That its history was tempestous is evidenced by the fact that its archpriest Avvakum led the party of religious dissenters, or Old Believers. After numerous renovations of the cathedral undertaken in the imperial period, the original design was lost behind later additions. The distinguished Russian restorer Peter Baranovsky supervised a complete reconstruction of the church's exterior to its original design in 1929-1932. Some specialists, however, criticised the accuracy of this reconstruction. In 1936, when Red Square was being prepared for holding the military parades of the Soviet Union, Joseph Stalin ordered the square cleared of churches. Although efforts were made by Baranovsky to save it, he could not prevent the Kazan Cathedral from being demolished (though Baranovsky did manage to save another of the square's cathedrals, Saint Basil's Cathedral from destruction). After the fall of the Soviet Union, the Kazan Cathedral was the first church to be completely rebuilt after having been destroyed by the Communists. The cathedral's restoration (1990-1993) was based on the detailed measurements and photographs of the original church Peter Baranovsky made before its destruction in 1936. This page was retrieved and condensed from (http://en.wikipedia.org/wiki/Kazan_Cathedral) see Wikipedia, the free encyclopedia, January 2008.